Harvesting squash. Photo courtesy of Shannon Spurlock. For years, residents of Denver, Colorado may have scratched their heads over that question, because most of the city’s food supply was sourced from elsewhere. Recently, however, stakeholders in the private and public sectors collaborated to help food growers prosper within the Denver metropolitan area. 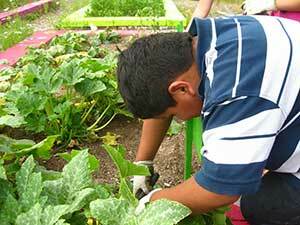 Some stakeholders have their hands in the dirt, teaching urban agriculture methods and building community gardens. Others are working behind the scenes to change the laws governing land use in Denver. All are working toward a goal set by Mayor Michael Hancock in 2013 to acquire at least 25 percent of the city’s food from “sources produced (grown and processed) entirely within Colorado,” according to the Mayor’s 2020 Sustainability Goals. One stakeholder, the Denver Sustainable Food Policy Council www.denversfpc.com, is a public-private coalition established in 2010 with a mission to increase food security and promote a sustainable and healthy food system, while also keeping economic and environmental interests in mind. Shannon Spurlock sits on the Denver SFPC; she is also Community Initiatives Coordinator for Denver Urban Gardens. According to Spurlock, DUG’s purpose for the past thirty years has been to build community, one urban garden at a time. Now her organization partners alongside other groups with similar missions. Another member of the Denver SFPC is Eric Kornacki, Executive Director and Co-Founder of Revision International, which works to create food security in some of Denver’s low-income neighborhoods. He sees promise in a proposed ordinance the Denver SFPC is sponsoring this year with Denver Councilwoman Robin Kniech, which would allow the sales of fruits, vegetables, and “cottage foods” (food products made from fresh produce grown in home gardens, such as jams or honey) as home businesses within the city. The State of Colorado already allows residents to sell cottage foods on their premises; this new ordinance would bring the city of Denver in-line with a state law already on the books. Denver’s zoning laws were previously updated in 2011, when the Denver City Council passed an ordinance allowing citizens to raise chickens and goats on their properties. Currently fresh produce can be sold on school or church sites, at a farmers’ market or restaurant, or directly to consumers only if the produce is grown in a garden in a nonresidential zone. Both Spurlock and Kornacki see room for improvement in other policy areas. Kornacki also notes a problem with land access and affordability, problems familiar to rural and urban farmers alike. He also sees a need for more collaboration between producers. Kornacki sees a bright future for urban agriculture in Denver, even with some growing pains along the way.